Las Vegas, April 24, 2017: One of the world’s largest internet-based TV and On-demand service provider for South Asian content, YuppTV, announced the launch of Freedocast Pro Device and Freedocast Live Streaming Platform. Providing end-to-end solutions for users to go LIVE instantly, anywhere anytime, the Pro Device & Live-Streaming platform also enables users to broadcast live videos on multiple platforms such as, Facebook and YouTube Live, Twitter/Periscope and others. 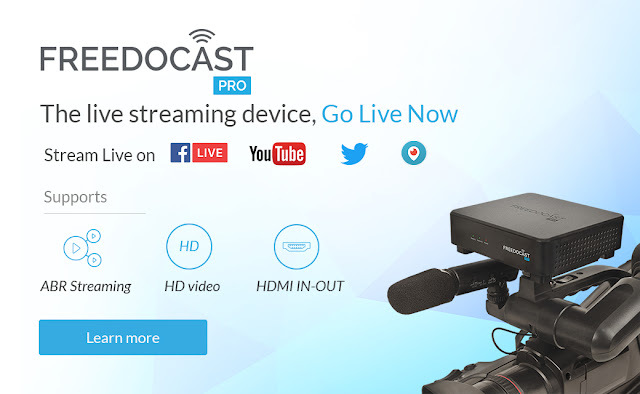 The latest offering, Freedocast Pro Device broadcasts live videos in HD Quality. The Device can be connected to any video source including camera and switcher to go live and can be easily controlled via Android/iOS App. The App can be used to preview, control & monitor live broadcasts. The Device also has a rechargeable battery supporting over 2 hours of continuous live streaming and offers HDMI IN/OUT & MIC-in for AV source connectivity. Freedocast offers tailor-made solutions for broadcasters to aggregate, edit and broadcast events in-real time to their studios and multiple platforms. This solution is aimed to improve Broadcasters efficiency and productivity to stay ahead of competition. Celebrities and influencers can maximize the value of their social media programs by hosting special interactive sessions through Freedocast. Broadcasting sporting events, webinars, etc can be streamed to multiple platforms to increase the audience size and bring in new revenue streams for the broadcasters. YuppTV will demonstrate its new offering Freedocast Pro and Freedocast Platform at NAB show 2017 at YuppTV booth SU11402CM, Las Vegas Convention Centre. Freedocast is a product by YuppTV, pioneer and one of the world’s largest online over-the-top (OTT) entertainment solutions provider. Freedocast is a live broadcasting solution which enables the user to live stream instantly anywhere anytime. Broadcast simultaneously to multiple platforms like fb Live, YouTube Live, etc. Freedocast provides Adaptive Bitrate Streaming which enables streaming even in low bandwidth.